If your objective is to increase the size of your physique, or to become stronger or more powerful for work or sport, then resistance training should be a vital element of your exercise sessions. Free weights are the best tool for this, because they provide resistance to multiple muscle groups throughout the whole range of movement, thus ensuring that all the necessary muscles around a joint are trained. Furthermore, functional exercises can be incorporated into your training, so your body as a whole becomes stronger in the dynamic movements it is designed to perform, and co-ordination , balance, and skill all benefit. 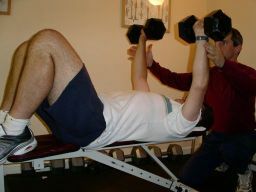 These sessions are high intensity and require a variety of training techniques to achieve optimum results. Goals can be general or very specific in nature and it is important to develop a concurrent eating plan to maximise energy levels and muscle gains. This type of training is very enjoyable, and, if you are highly motivated, you can make a significant difference to the size and definition of your muscles.